A number of commitments to help bring modern and reliable energy services to impoverished rural communities were announced by UNDP, WHO, the Alliance for Rural Electrification and several other stakeholders at the “Global Conference on Rural Energy Access: A Nexus Approach to Sustainable Development and Poverty Eradication”, which took place in Addis Ababa, Ethiopia, from 4 to 6 December 2013. The commitments were made as a contribution to the 2014 – 2024 UN Decade of Sustainable Energy for All. 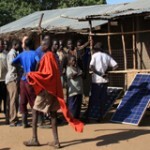 The main theme of the Conference, which was organized by UN DESA, in collaboration with Sustainable Energy for All (SE4All), UN-Energy and the Economic Commission for Africa, was the essential role that access to energy services has for enabling sustainable development and poverty eradication. Over 250 participants from 40 countries attended the Conference. Participants agreed that lack of clean, affordable and reliable energy is at the heart of a range of interconnected problems faced by the energy poor in rural areas. Discussions therefore focused on a nexus approach to sustainable energy, which acknowledges the strong link between energy and other development factors such as education, health, gender, environment, economic growth, food security, and water, and seeks to address these in a holistic way. In his introductory statement via a video message, the UN Secretary-General’s Special Representative and CEO for SE4All, Mr. Kandeh Yumkella, highlighted some of these inter-linkages: “Without energy, our hospitals will not run well; without energy, our children cannot study at night; without access to energy, we cannot process food and store it long enough to deal with food security issues.” He also pointed out that lack of reliable energy prevents businesses from competing and creating jobs. The case for commitments was not only strengthened by this nexus, but also by numbers: 85 percent of the 1.2 billion people who lack access to electricity and 78 percent of the 2.8 billion who still rely on unsustainable solid biomass as fuel for cooking and heating, live in rural areas. Globally, there are close to 4 million premature deaths from household air pollution every year, 70 to 80 percent of which are women and children. Household pollution “is the number four killer in the world; it is the number two killer of women,” said Mr. Yumkella. The ensuing discussions and presentations demonstrated that successful models and pilot projects to bring sustainable energy to rural areas exist, but limited progress has been made, in particular in Africa, in translating these approaches into effective action. Exploring the reasons for this, and suggesting remedies, was another important Conference theme, in line with the Conference objective of providing an opportunity to share and strengthen capacities on policy, technical and entrepreneurial approaches to sustainable rural energy access. Considering the numbers involved, commitments that increase sustainable energy access to rural areas have the potential of improving the lives of millions. UNDP announced its intention to create a Hub for decentralized, off-grid “Bottom Up” Energy Solutions to advance the SE4ALL Country Actions Agenda, building on two decades of experience in linking energy and sustainable development. UNDP also committed to continue its advocacy for energy as a critical component of the post-2015 development agenda. The Alliance for Rural Electrification committed to launching two awareness raising campaigns in 2014, which will target energy decision-makers in developing countries. The first campaign will focus on the contribution of small hydro power technologies for rural development, and the second one on hybridization of off-grid systems. Based on the good experience made with previous Stakeholder Dialogue events, the Alliance will also organize further business-matching events in Africa together with Practical Action in the context of the African EU Energy Partnership. In 2014, the Alliance also plans to launch a study to contribute to the better understanding of the financial requirements to mature nascent rural electrification markets based on mini-grid technologies. The WHO will contribute to SE4All by, among other things, launching the new WHO guidelines on house fuel combustion solutions, with evidence of the levels of health benefits that can be expected from different home energy technologies and fuels, clarifying remaining knowledge gaps about what are healthy home energy interventions. This should generate the missing knowledge for arriving at solutions that can be prescribed by doctors for health protection. An innovative “Twin Schools” programme, with technical and social components, was also announced at the conference. This partnership would involve the development of inexpensive, high quality solar equipment and training systems to promote rural electrification, as well as an educational exchange linking universities and secondary schools in developed countries with universities and schools in developing countries. A team of teachers and students will be trained in the selected developing countries to install and maintain solar systems in rural communities. The programme will be initiated by UN DESA in partnership with a local government in a rural area in Bolivia, and two NGOs, the Institute for Decentralized Electrification, Education and Entrepreneurship (id-eee) of Germany and Energetica of Bolivia. The NGO AMISTAD (Actions pour la Mobilisation des Initiatives et STratégies d’Aide au Développement) of the Ivory Coast committed to organizing competitions on innovative approaches and applications for rural energy access, and to provide energy access to 50 Ivorian villages within the UN Decade of Sustainable Energy for All. Fosera Manufacturing PLC announced the launch of the local assembly Line of FOSERA off-grid lighting products in Ethiopia. An exhibition, at which 25 organisations displayed renewable energy technologies that enable affordable, clean energy, was an integral part of the Global Conference. The exhibition demonstrated that advanced “clean” cook stoves and stand-alone electric generation systems, which are practical, reliable and durable, are both widely available and affordable.